At Brieden Orthodontics, we strive to provide premium quality orthodontic treatment to patients of all ages in a fun, friendly, and welcoming office environment. Dr. Brieden and our highly-trained team of orthodontic specialists work with patients individually to create customized treatment plans, and we strive to make orthodontic treatment fit into your lifestyle – not the other way around. While most of our treatments center around straightening the teeth through braces or Invisalign, we also want to help protect your teeth. Athletic mouthguards are a critical part of achieving that goal. 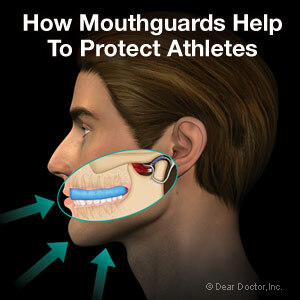 Why Get an Athletic Mouthguard? Leading an active lifestyle is important. Regular, moderate exercise has been shown in countless studies to lower blood pressure, control cholesterol, and even help mediate feelings of anxiety and depression. Unfortunately, though, most forms of exercise – especially the sports that kids participate in – also come with a serious risk of dental injury. Sports-related injuries are remarkably common among kids, and roughly 25% of the dental injuries we treat children for come from sports-related injuries. Despite the risks, though, playing sports is still healthy for almost any child – and an athletic mouthguard can help them do it safely. 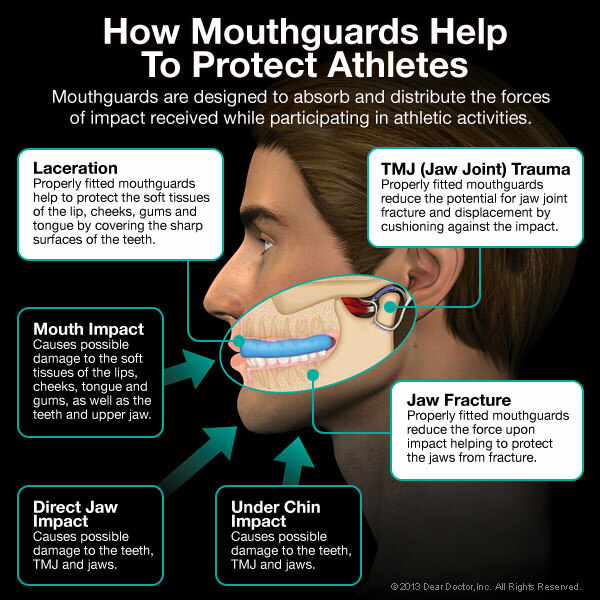 A custom-made athletic mouthguard helps to protect teeth and orthodontic appliances from trauma, preventing breakage and damage from falls, impacts, or other accidents during sports. Used correctly, a custom-made mouthguard can reduce the likelihood of a dental injury 60-fold! An athletic mouthguard is vital to protecting the dental health of any athlete, and if your child regularly participates in a sporting activity, it's important for them to have that protection. But which kind of mouthguard should you choose? There are a number available, including? Off-the-shelf Mouthguards: If you walk into your local sports retailer, you'll probably find standard, off-the-shelf mouthguards. These usually come in three sizes and are held in place by clenching the teeth. These mouthguards are better than nothing, but the protection they provide is limited, and we wouldn't recommend them. "Boil and Bite" Mouthguards: To use this mouthguard, you put it in hot or boiling water to soften it, then bite down to fit it in place. These offer a step up in fit, quality, and protection, but again, it's hard to guarantee – there's just too much variation on the market to ensure your child's teeth are protected. Custom Made Mouthguards: The other option is to visit your local New Baltimore orthodontist and have them custom-make a mouthguard specifically to fit your child's teeth. Custom mouthguards guarantee the proper fit and strength, offering the best protection possible for any sport. A custom-made mouthguard is the only way to ensure your child has the most protection on the field, and should really be thought of as an indispensable piece of equipment. If your child plays any sport or athletic activity, they should have a custom-made mouthguard to protect their teeth from injury – plain and simple. Custom-made mouthguards are vital for minimizing your child's risk of tooth injury, and if you'd like to get one for your child, we can help. Contact us today to learn more about custom mouthguards and schedule an appointment for a fitting. We'll create a mouthguard that perfectly fits your child's teeth and mouth, ensuring proper protection on the field and preventing injury. We can't wait to hear from you!